This post is based upon an experience that I had at a local restaurant recently. Firstly, I understand how horrible being a server can be. Having to deal with both rude customers and the kitchen can stress even the most calm person out. 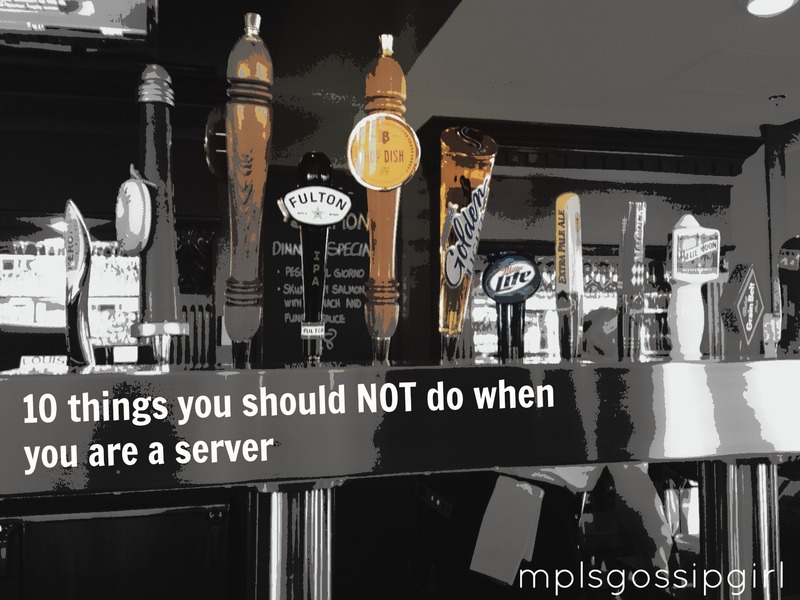 Most servers that I have encountered in Minneapolis and surrounding areas get most everything right. They would never come close to committing any of the food crimes that I witnessed on this occasion. Sit down and read a book on the floor when you have people in the restaurant. Even if the restaurant isn’t busy never do this on the floor. When a customer asks you a question about selection don’t just point to the menu. You should verbally give them the selections and also suggest which ones you like or which ones are popular. Especially, when it is ethnic food. It is a great way to get someone to try something new. Don’t hover. Yes, I do want to order but give me a second to sit down and look at the menu. I know you want to sit and read your book. But, I am not ready to order yet. Set down the food and run away without explaining what it is. Tell me about it. Try to turn everything into a joke. It really isn’t that funny that you are really horrible at your job. Act like you own the restaurant. Bossing other workers around and being loud in the kitchen while you do nothing makes you look like an idiot. When bringing the bill try not to say anything about your tip. Don’t blame others. If something came out of the kitchen incorrectly get it fixed. Put a carafe of water on the table and tell the customers that you will not be refilling their water glasses because you put that carafe on the table. You jokingly say that it is because you are too lazy. Well, they know you are too lazy. Blame the customers for your low tip because they are cheap. It might just be you. Andrew Zimmern doesn’t always get good service either which makes me feel a little bit better. He wrote about a Sushi Restaurant in NYC recently in @mspmag titled When Restaurant Service Goes South. It is a great read. Cheers to all those servers out there that make dining out an enjoyable experience. Have you had any bad experiences with service in Minneapolis? What are the best service experiences that you have had? One of mine was at Twin City Grill. I haven’t been there for a long time. I will have to check out the Glockenspiel again. I love having great service.